On An Overgrown Path: Where have all the songs of conscience and concern gone? Where have all the songs of conscience and concern gone? If you don't like the news ... go out and make some of your own. That was the catchphrase of Wes ("Scoop") Nisker on San Francisco alternative radio station KFOG. Among his other KFOG pearls of wisdom that are uncomfortably relevant to our current predicament is the traffic bulletin "People are driving to work to earn the money to pay for the cars they're driving to work in. Back to you". Where have all the songs of conscience and concern gone? Gone to social media everyone. It seems there may not be many more songs of conscience and concern on KFOG. 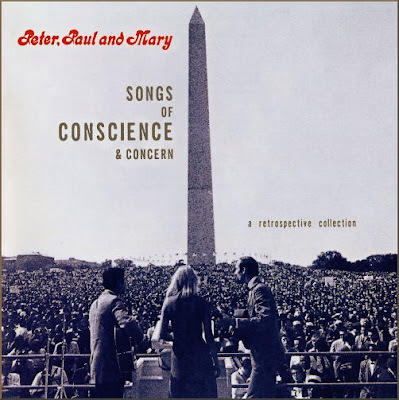 More on that Peter, Paul & Mary album via this link. Any copyrighted material is included as "fair use" for critical analysis, and will be removed at the request of copyright owner(s).